Elder Scrolls: Legends becomes the latest battleground. 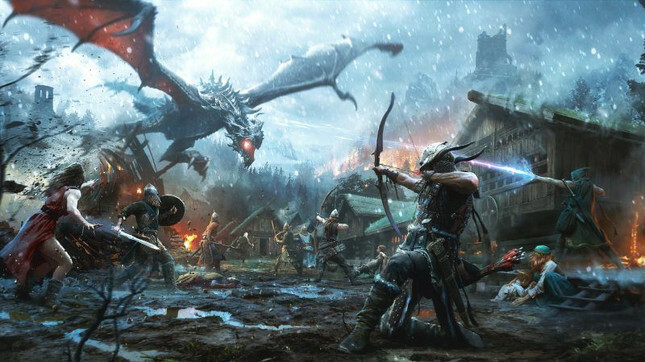 Bethesda are back fighting the good fight for cross-play on console, with Elder Scrolls: Legends becoming the latest title to raise the issue. In an interview with Game Informer, Bethesda's senior VP of global marketing Pete Hines drew a line in the sand when discussing the studio's card battle game. "[The Elder Scrolls Legends] is a strategy card game that encompasses both single and multiplayer. It is both cross-platform play and cross-platform progress. "It is our intention in order for the game to come out, it has to be those things on any system. We cannot have a game that works one way across everywhere else except for on this one thing." Elder Scrolls: Legends has already released to mobile and PC, with a console release on the horizon. Hines continued, noting "we can't be talking about one version of Legends, where you take your progress with you, and another version where you stay within that ecosystem or its walled off from everything else. That is counter to what the game has been about." While Hines didn't call out Sony specifically, his company has been vocal about the issue in the past. Most recently with Fallout 76, where creative director Todd Howard noted Sony's lack of cooperation on the matter. Bethesda are just another developer pushing the issue. Rocket League developer Psyonix has previously noted that cross-play could happen in a few hours. Meanwhile Nintendo and Microsoft are already enjoying a cross-play on Fortnite, a fact the two companies have happily rubbed in Sony's face.